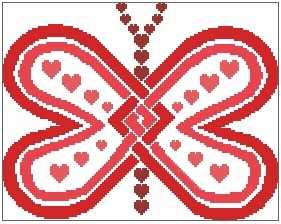 Heart Winged Butterfly is a colour chart measuring 138 stitches wide by 109 stitches high and uses 4 DMC colours. A full colour usage list is available on request. Half of the money made from the sale of this chart will be donated to KLT Charting's monthly charity. Bought this chart to be printed and was delivered within a week along with my fabric. Can't wait to stitch it.